On 25 March 2015 the UK Department of Energy and Climate Change (DECC), together with the Department for Business, Innovation and Skills (BIS), released a collection of in-depth studies on the potential pathways for cutting CO2 emissions from heavy industry entitled “Industrial Decarbonisation and Energy Efficiency Roadmaps to 2050”. Bellona considers this study highly significant as it examines long-term decarbonisation options for industrial processes. Being highly emission-intensive and amounting to roughly one-third of global energy use, decarbonising this sector is essential to addressing climate change. A key conclusion is that Carbon Capture and Storage (CCS) technology is the only viable route to tackling CO2 emissions from steel, cement, chemicals and refining. A separate report for each industry sector has been made available, laying out the potential pathways for decarbonisation. The emphasis is on collaborative working between industry, government and other stakeholders, while taking into consideration issues such as supply chains, customer demand, the wider global perspective, and technical and commercial barriers. The roadmap for CO2 reductions from the UK cement industry puts CCS at the centre of any deep decarbonisation of the industry. The research focuses on CO2 reduction from UK-based facilities, but the findings are representative of the emissions reduction potential of the European and global cement industry. 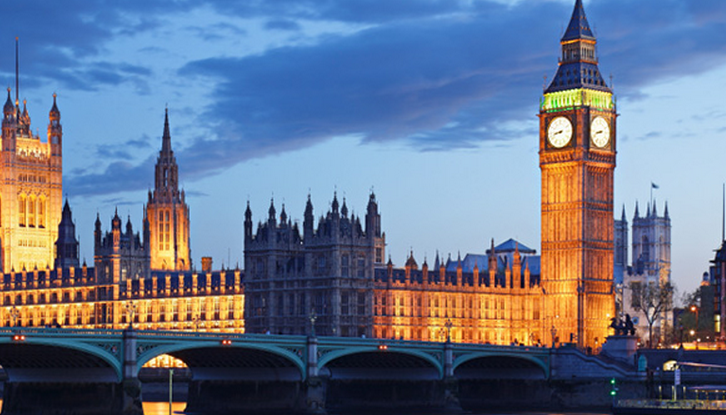 Current CO2 emissions from the UK cement sector amount to 7.5 million tonnes per year. 60% to 65% of this CO2 arises not from the combustion of fossil fuel, but from the conversion of limestone to calcium clinker, the major constituent of cement. The roadmap examines a diverse range of technologies that can be used to reduce these emissions over time to 2050 and finds CCS is essential. Contrasting the two scenarios that attempt to achieve substantial CO2 reductions makes evident how critical CCS will be in the supply of low carbon building materials. The first scenario “max tech no carbon capture” employs all anticipated technologies to reduce the CO2 intensity of cement production. However, even with a diverse range of technologies and efficiency improvements CO2, emissions from the sector are only reduced by 25% in 2050 (1.9 million tonnes of CO2 avoided). Fuel switching to biomass – 100% use by 2050. In the absence of CCS this option results in the largest emissions reduction of 17% in 2050, and is responsible for 70% of the total emissions reduction in the no-CCS scenario. Cementitious substitution – 100% use by 2050. The substitution of clinker for other materials could reduce the UK cement industries emissions by 2.3%. Alternative cements – 100% use by 2050. The use of alternative raw materials may achieve emissions reductions of 2.1% in 2050. Oxygen enrichment technology – 100% use by 2050. The use of oxygen to increase combustion efficiency only has the potential to reduce emissions a further 2.0% in 2050. 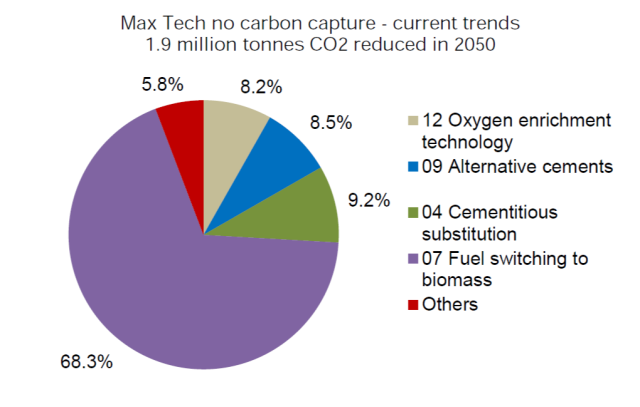 It is clear that the combined CO2 reductions of these technologies will not be sufficient in reducing CO2 emissions from the UK cement industry. At present the global cement industry is responsible for 5% of global emissions. In the absence of CCS the combined use of the best available technologies to all plants can only reduce those emissions by 25%. Indeed even this 25% reduction may not be feasible due to high competition (eg. aviation fuel) and challenges in ensuring sustainability for biomass. 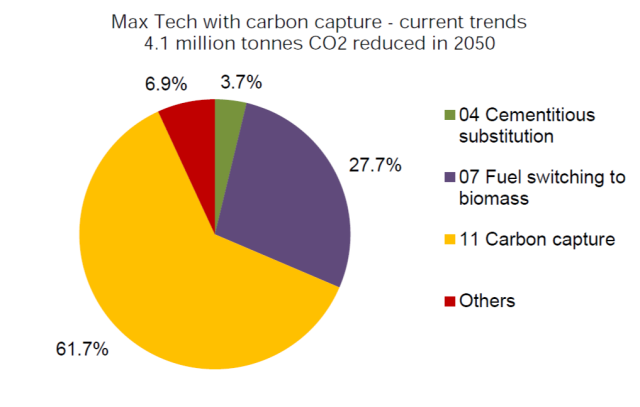 The scenario “max tech with carbon capture” includes a diverse range of CO2 reduction technologies and CCS. These together achieve CO2 reductions of 54% in 2050 (4.1 million tonnes of CO2 avoided). The application of CCS alone achieves 2.5 million tonnes of CO2 reduction in 2050. In contrast the full decarbonisation of the electricity grid contributes emissions reductions in 2050 of 8.5%. CCS is deployed – 100% use by 2050. CCS accounts for the majority (62%) of the total emissions reduction from deployment of options in 2050. Fuel switching to biomass – 100% use by 2050. Emissions reduction of 14.9%, which accounts for 28% of the total emissions reduction from deployment of options in 2050. It also appears the scenario did not include capture of biogenic CO2 from combustion and the resulting potential for carbon negative cement. Cementitious substitution – 100% use by 2050. Emissions reduction of 2.0% in 2050, compared with 2012, which accounts for 4% of the total emissions reduction from deployment of options in 2050. The roadmap rightly identifies the crucial need for CO2 transport and storage infrastructure to enable the required CO2 reductions from the cement industry. Such CO2 transport and storage networks will need to be present throughout Europe in order to decarbonise not only cement but also other CO2-intensive industries such as steel and refining, as well as the power sector. Bellona agrees that collaboration both within the sector and externally is necessary to establish these transport and storage networks, along with the availability of sources of funding appropriate to this type of shared infrastructure. As with the ZEP Business models for commercial CO2 transport and storage, the DECC study also recommends that a future strategy for the development of a CO2 transportation network should be considered with government taking a lead. The report recommends a UK CO2 Pipeline Roadmap to provide clarity for future CCS infrastructure.